In any race, but especially the longer distances like a full or half Ironman, your job as an athlete is to manage your day as it comes to you. Rarely does anyone have a perfect day, but that doesn’t mean you can’t have a good race. You have plenty of time to manage any issues or problems as they come to you. But as long as you keep your cool, stay rational and positive, you can manage almost any situation the race deals to you. Over my racing career I don’t think I’ve ever had that proverbial “perfect race” we all chase. I’ve had plenty of successful races, but I can think of things that didn’t go perfectly on those days. Even on my wins and podiums, I managed issues to achieve a great result. I remember watching an interview with one of the members of the Naval Special Warfare Development Group (commonly called Seal Team 6) who had been on the Bin Laden raid. These team members are the absolute best of the SEALs and they train every day to take on the toughest missions. He said a few things that left an impression with me. He said that on the mission “we’re really good at playing pick-up basketball.” With that he described that a mission plan is only good in the planning room, that when they get in the real world things always go wrong or change, so they are the best at adapting and adjusting the plan on the fly to still execute the mission. They train so much that when things go wrong, they can calmly change their plan as they go without panic. I don’t want to compare what we do to the dangers and stresses these guys face. The decisions we make just mean we go faster or slower. For them it’s life and death, so I don’t draw a comparison in that light. But we can learn from their outlook. If they can remain calm and methodically and deliberately adjust their plan on the fly, so too can we manage our race day as circumstances change. You train every day for weeks, months, and sometimes years for your races. You need to learn to trust your experience. Use your training and past races (both successes and failures) to learn to make rational decisions in the moment. I can guarantee things won’t go according to plan. How you react when that happens dictates the final outcome. I tell my athletes that on race day, your only job is to execute and manage your day. You’ve done the training and your body knows what to do. You need to let your body go do that. Your mind just has to focus on making the best decisions it can as the day unfolds. First, you have to learn to stay calm. Yes, you are breathing hard, your muscles hurt, and your body is being taxed, but that doesn’t mean that your head has to be in a state of panic. Keep your brain calm, aware, and rational. Do you think race car drivers or fighter pilots are in a state of panic when they’re in the thick of it? No way. They are in extremely stressful situations, but they are focused on executing and making calm rational decisions. It’s just like Captain Sulley stayed calm and managed the chaos when crash landing in the Miracle on the Hudson. If they can do it, so can you. Because half and full Ironmans are very long days, you have time to manage things that pop up. Yes, many scenarios can result in lost time or a little slower race, but many times if you stay calm and make good decisions, you can limit those losses. If you panic and start making poor decisions it can ruin your day. You would be surprised how many athletes I’ve seen panic when something doesn’t go according to their perfect race plan. They either give up, or make a poor choice resulting in a blown race. It doesn’t have to be that way. Here is an example from my experience. I was racing the Ironman North American Championships at Ironman Texas back in 2011. Starting the bike, I mean within 50 meters of transition, I hit a big bump in the road. It was hard enough that it bounced the magnet off my wheel that runs my bike computer. At the same time, it jettisoned a water bottle with about 500 calories off my bike. The bottle hit the ground and burst open. So about 10 seconds into the bike, I had no way to track my speed and effort on the bike and I was missing 500 calories from my race plan. Rather than panic, I told myself I’ve trained at my effort level on the bike enough to know how to manage my effort. I turned to my wrist watch. I know that a speed of 25 mph covers 5 miles in 12 min and the Ironman bike course has a marker every 5 miles. I could then keep an eye on my watch and calculate my average speed in my head (plus or minus) over each 5-mile segment. I could use that measurement along with my feel of perceived exertion to manage my bike effort. To manage my loss of 500 calories, I just made sure I slowed down at 5 aid stations to not only pick up my normal bottle of water, but take the time to pick up an extra 100 calories of whatever nutritional product was on the course. I was biking in a line of guys, and I would make sure I put in an effort coming into each aid station so that I would be at the front. That way I could take the time to slow down enough to grab the calories and fluids while the train of guys passed me. By the end of the aid station, I would be at the back of the group, but I never lost the group to bike with. I ended up having a great race. I biked within 1 minute of my goal time without anything more than a wrist watch. It was all because I didn’t panic when something went wrong. I stayed calm and rational, then managed the situation. I could list here the many more things that have gone wrong in my 34 full-Ironmans. Trust me, there are plenty. I’ve reacted to the situations in different ways, so I’ve learned this first hand. Because I’ve accrued positive and negative experiences, I’ve learned to take that body of knowledge and use it to my advantage. Use your experience to your advantage. No matter what happens in your race, learn to control the controllable. There are many things out of your control, but you can control how you react to it. This doesn’t mean that you should wing it all the time. Make the effort to plan what you can control. For instance, you can plan and control your nutrition. I use XRCEL in my fueling before, during, and after my races. I plan how many bottles and when I’ll take my XRCEL. There are times when I may need more than my plan, like if I drop a water bottle filled with XRCEL. I put extra XRCEL in my special need run and bike hand-up bags in case something goes wrong and I need those extra calories. In your planning, think through what could go wrong, then think through how you will manage it. You have the ability to manage your day. Learn to be the best at adapting your play in your pick-up basketball game. 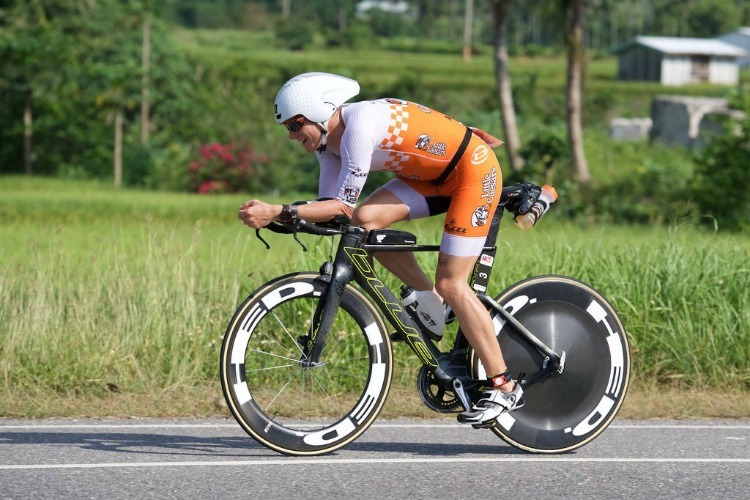 Patrick Evoe is a professional triathlete and an XRCEL ambassador. He is an Ironman and Ironman 70.3 winner, as well as 8x full Ironman podium finisher. He brings with him a wealth of experience and knowledge with nearly a decade of professional Ironman racing and 34 full Ironman finishes. You can find more information about Patrick on his website Patrickevoe.com connect with him on Twitter (@patrickevoe) and Facebook (@patrickevoeracing).